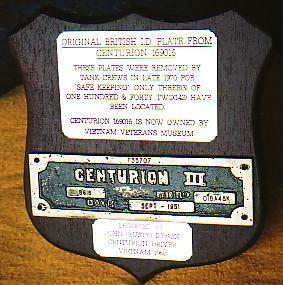 All Centurions brought by the Australian Army had a British ID plate fixed in the drivers compartment beside the drivers left shoulder. 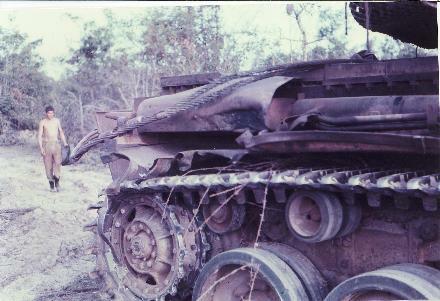 Modification plates were also fitted here by the Australian Army as the Centurions were upgraded or had base overhauls. 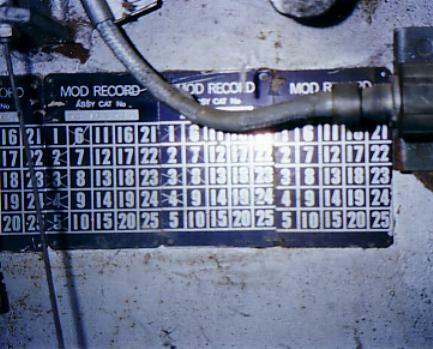 These plates could be identified by the British number stamped thereon, and of course the Australian number could be obtained by a cross reference to the listed British / Australian numbers. A Centurion held its number for life. If it should have a hull change due to say mine damage, the id plates went to the new hull. So it was possible for a Centurion to have three motors fitted, two transmissions and a couple of turret changes, replaced tracks and final drives so as there was nothing left of the original tank but it still retained the original number and so was still the elected tank. 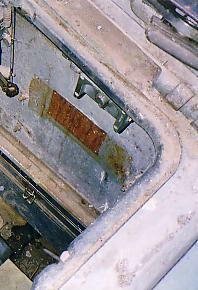 When the Centurions were to be sold in the early 1980's the id plates were removed by the crews, "For Safe Keeping". In my search of 122 Centurions I never found any id plates, everyone was missing. To my knowledge only three exist today169005 belongs to Major Peter Branagan who was the crew Commander of 169005. A second one belongs to Bruce Holt, owner of 169043. I have not seen this one but Bruce assures me he has it, and its from his own tank. The third one was the plate from 169016 the tank now owned by the Vietnam Veterans Museum at San Remo Victoria. I did try to buy this one and also tried to obtain it for the Vets Museum, without luck. Then this year it came up on EBay for sale. It was brought by John (Rusty) Dyson from Queensland . John like the true Tankie he is, in turn passed it on to me to donate to the Vietnam Veterans Museum. I have had it mounted on a plaque and a couple of signs made and fixed to the plaque and will be presenting it to the Museum shortly. I am assured that it will now stay with the tank it belongs to forever. It will be on display in the New Museum when its up and running with some other Armour gear I am collecting. This is the Plaque. I am waiting for special bolts to fix the plate but this is what it will look like. The thing was a swine to photograph because of the signs material, either you could not read it or the flash showed up in the photo so this is the best I could do. This is a good time to add a bit more on Rusty Dyson. I met Rusty over the net in my search for Centurions and this year met him in person when in Queensland with friend John Clifford, viewing other Centurions. Rusty picked us up from the airport, supplied accommodation and transported us over half of Queensland before returning us to the airport to catch our flight back home. A great friendship was formed and we have kept in contact since. Rusty was a Centurion Driver in Vietnam 1968--1969. He was involved in the Battle of Balmoral and also the Battle of Coral to name two famous Australian Battles that Centurions played a large part in. At the battle of Balmoral when the crew of 169069 were mounting up over the engine compartment a 82 mm Mortar hit the Centurion on the rear guard / exhaust muffler, wounding all the crew except Rusty who had entered the drivers compartment from the front. 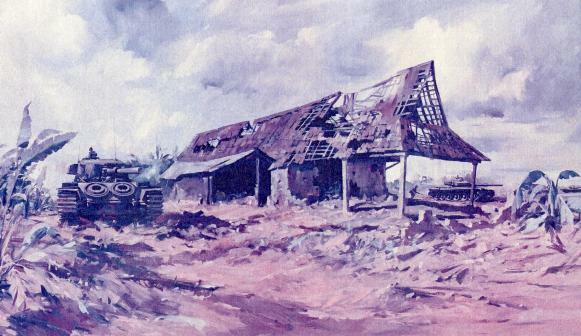 During May and June 1968 Units of The First Australian Task Force were sent from their base at Nui Dat to an area north–east of Saigon where the NVA and Viet Cong came looking for a fight and they almost owned the area. On 28 May 1968 the second attack against FSB Balmoral was launched by at least two Battalions of NVA. 2 Troop C SQN, First Armoured Reg. Call Sign 32A Crew Commander Sergeant Len Allen. Call Sign 32B Crew Commander Cpl. Shorty Britton. The attack commenced at 0230. Following a heavy mortars attack by both 82 Mil and 60 Mill mortars during which an 82 Mill mortar on the right hand track guard causing slight damage and wounding the three-turret crew who were entering the vehicle hit C/S 32. At 0615 hours (first light) C/S 32 and C/S 32C blasted a gap in the wire defences with canister shot between C/S 32A and C/S 32B position and moved out into the killing ground to the north of Balmoral in an effort to clear the battlefield. 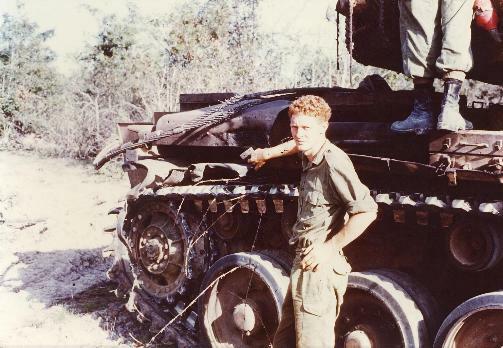 After an initial search a clearing patrol from 3 RAR began to search the bodies of the NVA. But at this time fighting broke out again and the infantry were withdrawn to allow the two tanks to complete a more detailed search. Several prisoners were then rounded up by the tanks and ushered towards the clearing patrol that had re-entered the battlefield. For some time firing occurred as prisoners were taken and areas cleared with NVA hiding and seeking protection in the numerous B52 craters that littered the area. Both tanks returned inside the perimeter at app. 0930. There is little doubt that without the tanks at Balmoral the loss of life to the Australians would have been much greater and led in part to the acceptance of the Centurions in particular, and Armour in general, into the Army of that day.